"Taylor Zebracki is a Senior songwriting major from Bradenton, Florida with a passion for Christian music. 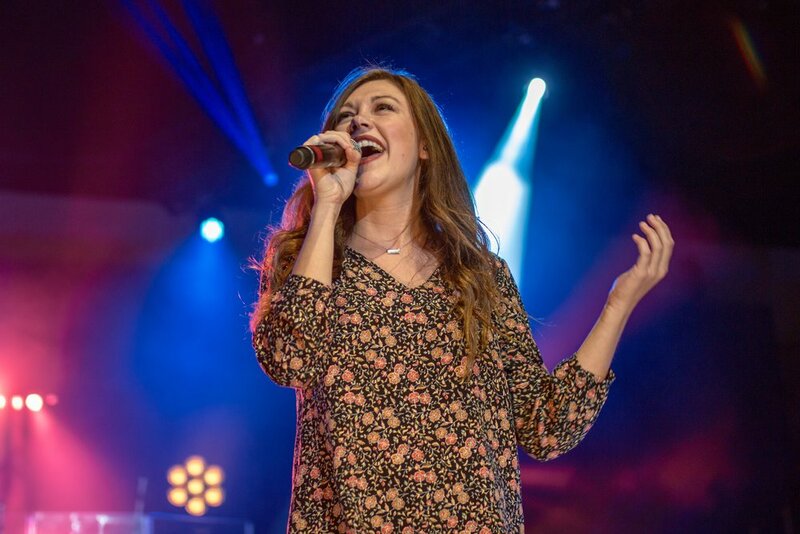 In her 2 1/2 years at Belmont she has participated in the 2016 Christian Showcase, numerous co-writes, and headlined a local show featuring other Belmont artists. Her compositions have been featured in a film, “A Way Out” and she currently serves as the president of the Belmont Christian Songwriting Community. She volunteers on the Cross Point Music Team but when Taylor isn’t writing or performing she loves to sit down and enjoy a good book. Her dream is to be signed in the coming year as a Christian artist and hit the ground running with recording her first album as well as touring." "Thy Kingdom Come became a worship duo in the fall of 2015. Zoë Morris (from Greenwich, Connecticut) and Jenna Nicholson (from Houston, Texas) met at Belmont University and after a joint show, knew the Lord’s hand was on their musical partnership. Since forming the duo, they have released a single, lead worship at youth camps, were the guest worship leaders at a book release, toured in seven cities, had multiple shows in Nashville, and are in the process of recording their first EP to be released this fall. They draw inspiration from Bethel, Hillsong, Mosaic MSC, Meredith Andrews and Kari Jobe. Thy Kingdom Come seeks to create an atmosphere of worship where the Kingdom of Heaven meets Earth." "Lauren Yaffe is a worship leader born and raised in Denver, Colorado. As a child, she dreamed of being a musician, and using her musical talents to glorify God. She first began leading worship in the seventh grade at youth group, and she's been leading worship and writing worship songs ever since. Lauren has interned at Red Rocks Church, the fourth fastest-growing church in the nation, for three years. She also leads worship at Cross Point church in Nashville, TN. Through these opportunities, Lauren has led worship for more than 15,000 people. She is pursuing her degree in Music Business at Belmont University in Nashville"